Are you tired of the stereotyped organizer bags following the same pattern? 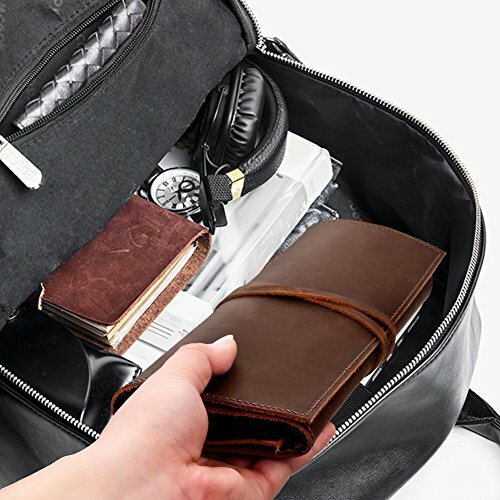 BY BARNEY Bags are specially designed to store your electronics accessories and other small items, meanwhile, they are made of genuine crazy horse leather, functional, fashion and vintage. Genuine crazy horse leather-- one piece full grain leather, no joint. 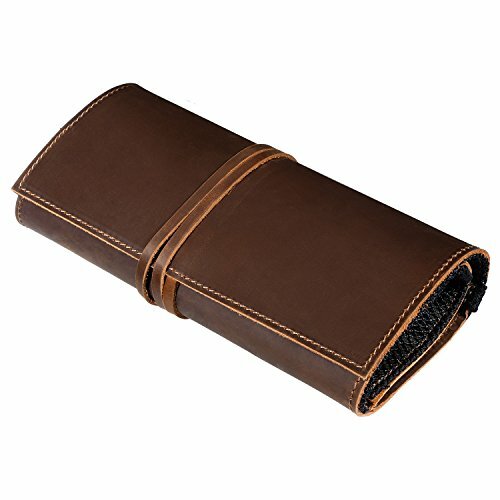 Cable Organizer--7 elastic loops and 1 leather Velcro keep your cables, earphones and adapter tidy and you know where they all are. Mesh Pockets--3 easy access mesh pockets to sort your memory cards, CF Cards, USB sticks, dongles and more. Mesh Zipper Compartments--2 mesh compartments to store external hard drive, power bank. 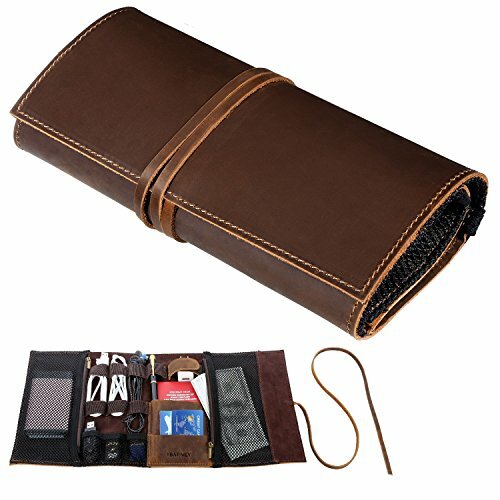 Flexible Storage:2 leather compartments to store cash, passport, boarding pass, etc. Multipurpose: it can be also used as cosmetic bags. Features: one piece full grain crazy horse leather, no joint. Fashion and function are one in the same. Crazy horse leather is famous with its disorder of surface and its effect of color changing when folding. Practical design provides great flexibility for organizing your accessories. 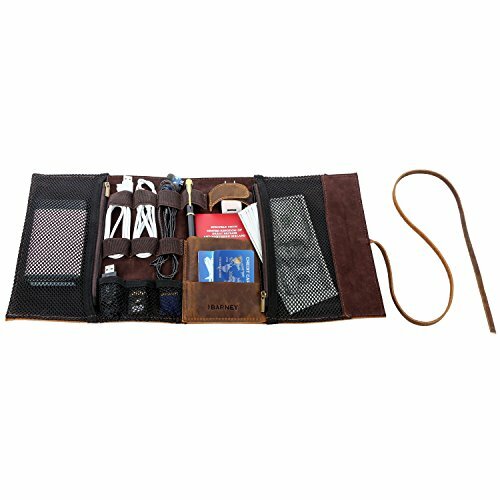 7 elastic loops for cables, pens, brushes and tools, etc. 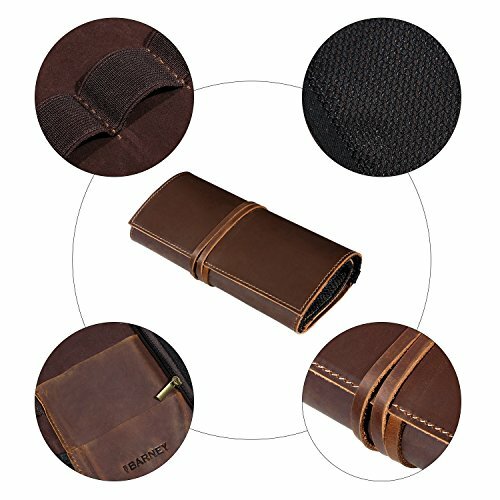 1 leather Velcro for adapter; 3 mesh pockets for USB, SD card, SIM card or other small items ; 2 mesh zipper compartment for phone, mouse, power bank, etc. 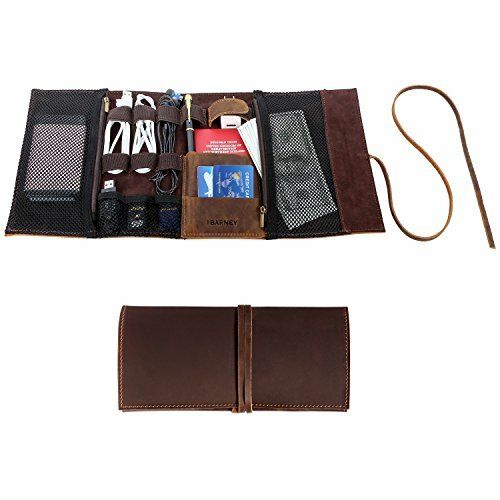 2 leather compartments store passport, boarding pass, cash, etc. Use it for work, travel, school and home. 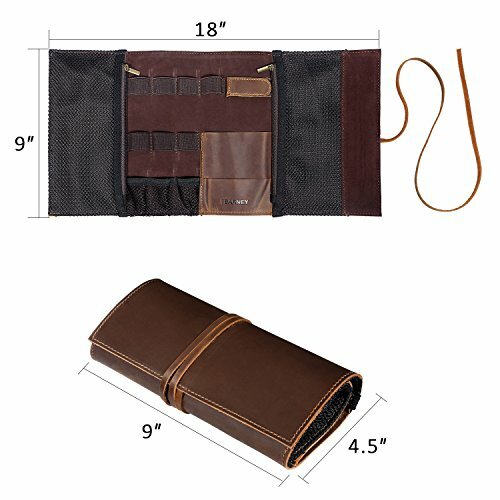 Rollable, portable, compact, lightweight, durable, sleek organizer to keep together your electronic accessories and other small parts. PLEASE READ: Genuine Crazy-horse cow leather has enough leather oil itself so it doesn't need to apply extra conditioner on the bag's surface. If it is dirty, please wipe the bag gently with a wet soft cloth and then put it aside in a windy place for several hours. Please DO NOT expose the bag under intensive sunshine for a longer time, or the leather will be cracked. When the bag is free of use, please protect the bag from moisture. If you have any questions about this product by BY BARNEY, contact us by completing and submitting the form below. If you are looking for a specif part number, please include it with your message.